Very easy to find. Get to Hemet, CA which is about 30 miles southeast of Riverside and west of the 215) . 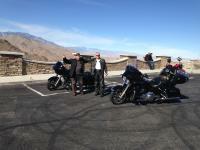 In Hemet, get on Route 74 and head east all the way into Indian Wells. Wonderful scenery. Pine forest on the Hemet side transitioning to desert on the Indian Wells side. Starts out twisty as you climb to the top. Once at the top the road is fairly straight. Road gets twisty again as you descend into the Coachella valley. Not a lot along here but there are nice hiking trails and camping. A couple of restaurants. I can recommend Paradise Corner at the intersection of Hwy 74 and Hwy 371.
on April 13, 2009 2 out of 3 members found this review useful. The road goes seemingly vertical for a few miles with sharp turns and switchbacks as it goes up the mountainside and thru the forests. After about 30 miles of stunning views you will come to the town of Idylwild where there is gas and great food. Follow 243 on down to Hwy 74. Turn RIGHT and return to Hemet. on March 30, 2009 1 out of 1 members found this review useful. East of Hemet, this road gets more and more interesting. Once you finish navigating the two 180 degree turns, it starts climbing - and twisting. Barring any cage traffic, from here to the top is pure ecstacy! on May 9, 2010 0 out of 0 members found this review useful. Really a great road. After passing by the 371 and 74 intersection coming from Hemet is where lots of scenes from the old movie its a mad mad mad mad world were filmed, in particular one of the first scenes where the car went off the cliff.